The story of the recent strike by National Football League referees will inevitably focus on the last-minute blown call that cost the Green Bay Packers a win against the Seattle Seahawks on Sept. 24. Very few will remember one of the principal reasons for the strike, which ended just a few days later: a pension dispute. The N.F.L. 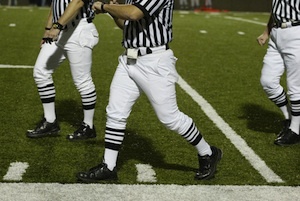 owners proposed ending pensions for referees in favor of 401(k) investment accounts. The referees balked, then ultimately agreed to a deal that kept their pensions but ended the practice for future hires. So ends another chapter in the sad story of workers’ rights. Pensions, a traditional form of retirement support, are very quickly going the way of the leather football helmet. Meanwhile, 401(k)’s and other individual savings accounts managed by employees are proving too anemic to support workers after retirement. People are simply not saving enough, and the market is proving too fickle to provide for workers in their retirement. (See “Our Ridiculous Approach to Retirement,” by Teresa Ghilarducci, in The New York Times, 7/21). The pension benefits would have cost N.F.L. owners $3 million, the price of a 30-second commercial during the Super Bowl. Their intransigence was not a matter of fiscal prudence but of cold-hearted management. Unfortunately, their position reflects a growing consensus among the American public, who are increasingly skeptical of pensions for public workers and others. The referee lockout could have brought this issue to the public consciousness. It did not. The referees signed a deal to protect their pensions while abandoning them for the next generation of officials. Now we can all get back to watching football. Everybody wins (except the Packers), right? The Obama campaign has issued a “faith platform” that describes how the president’s religious convictions relate to his political stands. The platform begins with President Obama’s belief that we must recommit to being “our brother’s keeper,” and it quotes St. Paul: “If one part suffers, every part suffers with it…” (1 Cor 12:26). Accordingly, the platform highlights Mr. Obama’s commitment to strengthening the economy, reforming health insurance, caring for military families, opposing the war in Iraq, preventing a massacre in Libya, forbidding torture, abolishing nuclear weapons, protecting the environment and cooperating with faith-based organizations to serve the common good. In other areas, however, Mr. Obama’s policies contrast sharply with what it means to be “our brother’s keeper.” The platform describes Mr. Obama as “pro-choice” and focuses on his belief that we should “work together to reduce the number of women seeking abortions.” But Mr. Obama wrongly opposes even common-sense restrictions on access to abortion. In foreign policy, the platform conveniently ignores Mr. Obama’s support for indefinite detention (see Editorial) and profligate use of drones. Under Mr. Obama, U.S. drones have hit targets in Pakistan 264 times. With Mr. Obama personally approving most hits, the U.S. has intentionally killed at least one American citizen. A report by the Bureau of Investigative Journalism estimates between 474 and 881 civilians, including 176 children, have been killed since 2004. In this light, Mr. Obama should be cautious in citing Cain’s question to God after killing his brother. God may respond, “What have you done! Listen: your brother’s blood cries out to me from the soil!” (Gn 4:10). While we dissect and discuss this month’s presidential debates, we should reflect on how it all got started: the seven debates between Abraham Lincoln and Stephen A. Douglas during their 1858 U.S. Senate race. That year the debaters spoke for three hours before a crowd of 15,000, typically—one a short, portly senator with a booming voice in a fashionable blue suit, who traveled in a special train; the other a tall, thin, homely lawyer with a high, piercing voice and wearing an ill-fitting black coat, who traveled as a regular passenger and chatted freely with his fellow riders. The voters’ choice then was not merely between two personalities but between two views of what America was all about. One way to understand the difference, says the Lincoln biographer David Herbert Donald, is to view Douglas as a defender of majority rule and Lincoln as a defender of minority rights. In 1858 that meant to Douglas that the government, Mr. Donald writes, was “made by the white man for the benefit of the white man.” Lincoln too favored self government; but in his judgment, no majority should limit the rights of a minority. In effect, the principal issue was slavery. Today’s ideological split concerns the role of government in promoting the public welfare. The choice is perhaps not as dire as the one that faced the antebellum United States. Still, the differences are clear enough: President Barack Obama says that the federal government is a vital force for good; Gov. Mitt Romney says it should get out of the way of progress. At the first debate, both men showed up wearing similar blue suits and American flag lapel pins. They differed only in the color of their ties and their skin. That itself is progress, a long way from 1858. Excuse me. The editors citing President Obama's beleif that "work together to reduce the number of women seeking abortions" is dated and is sharply contradicted by the 2012 Democratic party platform which for the first time seeks to make government financing available to people who can not affort abortions - in other words make abortion-on-demand.avalable nationwide. The actual effect will be to greatly increase the number of abortions by making abortions free to all. Very likely this would be implemented by a new regulation to Obamacare decalaring free abortion a medical neccessity just as distributing contraceptives.for free was declared by HHS regulartion to be a medical necessity therby redefining healthcare and its financing without legislative involvment by appointed HHS regulators. Why should the editors fool the readers into thinking there is no threat to greatly expand the number of abortions antionwide when there is? With certainty this is another Obama campaign promise that will not be keep after the election given the rank and file of the majority of the Democratic party beleive in the widest possible availabilty of abortion for free and paid for by the government? Why fool the public with pious falsehoods on abortion policy that do not reflect actual political reality? I prayed at Mass today (in Shanghai before heading home) that I would be more effective in helping our world solve the coming effects of the tidal wave heading towards our shores in the form of climate change. This IS the most serious challenge facing all of us and definitely not on the same level as who is going to buy our health insurance or how we will confront the debacle of Obama Care. That will be settled in the Supreme Court in our favor because we have reasonable faith in our Constitution and this is a case unlike Roe V. Wade. Catholic leaders of course will stand up for that until it happens and prevent enactment up to the Supreme Court. But clearly my conscience will not allow me to vote for a president who thinks it is ok to ignore climate change as being an "Al Gore fantasy". That is political poppycock. It is an excuse to ignore the facts or refusal to learn the true facts before commenting. The lies about climate change are supported by investors in fossil fuel energy companies especially a very small group of well paid political pundits supporting an even smaller minority who has most of the money on the planet. It is not possible to fix the climate change results if we wait longer to do it. But we have time to fix the health care issues. We won't lose our freedom as long as we are who we are but we will lose our planet as we know it unless we act now. The results of having a fair debate without action now is to face the worst of "...the last days". The rich and middle class will not face the suffering that the poor of the whole world will and has begun to. More lives will be lost beyond our worst imagination if we don't act now than could ever be caused by the "morning after pill" (that is also evil). Pope Benedict made it clear as did Blessed John Paul II that we are stewards of our environment. We have responsibility to act to protect it - all of us! They both referred to correcting the cause of climate change that is an undisputable anthropogenic (man-made) effect especially by the over use of fossil fuels. This IS priority number one. We must stop using coal, petroleum and natural gas or create the worst disaster to ever affect humanity. We are intelligent and either work together or die of greed. I am sorry if I have offended many of my brother and sister Catholics that deny climate change only because they cannot understand the science or bother to study and learn about it. If they could understand the science I am sure they would see that they as well I must in conscience pick between the least of two evils in this election! Don't forget, if we get our priorities straight, we have no choice but to vote for Obama and then take him on if he does not deal immediately with priority number one. At the same time he has to realize that there is no health care in the US without Catholic hospitals. In the end we of course will force him to understand that our health care is going to be consistent with our Catholic Religion. Please pray for guidance and wisdom as I know you are doing more than ever! "They differed only in the color of their ties and their skin"
I may be a minority of one but I thought I saw significant differences. One regards the office of US President with profound seriousness, the other simply profoundly wants that office - at the cost of integrity, consistency, truth, whatever. I wondered how anyone could, in good conscience, vote Democratic if they were practicing Catholics. Now I understand how you might be tempted to - because there are other issues such as climate change. There is also the programs that help the poor, the way Hispanics are treated because of laws regarding citizenship. However, you really have to weigh which issue is most morally corrupt. In my opinion, it is the abortion issue and the fact that we are allowing the government to use our taxpayer money to fund abortions. I agree with you that taking care of our earth is our responsibility but we need to get back our values. When we can stop fighting about that and the terrible atrocities that this country is committing, THEN we can work together to save the plant. Better save the people first! I know you think I don't get it and that, scientifically speaking, you are more educated than me - and you may be, but I cannot "get around" the fact that it is my responsibility to vote in agreement with the commandments of God. The differences between President Obama and Gov, Romney are stark - the former more in step with Economic Justice for All, and the latter in step with Atlas Shrugged. Neither fully meets all the concerns of the RC Church, but the President's economic policies make him, by far, the candidate Catholics should support. Paid for their car insurance. They helped pay for their college. They all have good jobs and never had to ask for money. I just retired. I do not have to worry about money because it is there. Pat, I am certainly happy for you, and I pray that others have the same experience. But there are other stories out there. For instance, the person who worked for nearly forty years, saved up in 401(k)s and IRAs, etc. But who with just 5 years left to go before retirement was suddenly laid off. Not qualifying for Medicare this person had to spend nearly $18,000 a year on medical insurance. Despite careful planning and sacrifice, he also still had pay on a mortgage. Then there was the college funds that had been set aside... never quite enough with the dramatically rising cost of tuition so by the last of four children there were loans that now had to be paid off. Then there were the arrival of grandchildren and the trips necessitated by their living far away. And do you realize how fast 2-years of rainy day funds disappears after being laid off for 30 something months because businesses are getting away with murder when it comes to job discrimination against seniors. On and on this hit this person... something like the story of Job. Despite all "It Happens" and all the plans are flushed and the money evaporates in a recession and must be spent before there's a recovery. So do we say to that person, "Tough luck and God speed"? I'm glad you have all those things, but guess what... you were lucky. You may think it was your fiscal management skills, your frugality, you common sense that got you to where you are today, but without a lot of luck, or fate, or blessings from God (not to mention Social Security and Medicare) a person could find him or herself hoping there's enough dog food to share with the family pet and praying that the heart condition doesn't worsen. The vast majority of the 47% are good people who did everything right but still ended up needing help. Some even found themselves destitute and homeless. So to you and to some of the other commenters, social justice issues are NOT optional or secondary. Thousands, hundreds of thousands, millions of lives are depending on our U.S. Congress to do the right thing... whether under an Obama administration or a Romney administration. Our editors are correct to say there is an ideological split between the candidates on the roll of government for the public good. But they don't state those different visions of the role of government with sufficient accuracy. President Obama, unlike President Clinton who famously declared the Era of Big Government is over and proceeded to succeed economically by adhering to that principle in most of his actions, is attempting to bring the Era of Big Government back. Romney, much more closely aligned with the government role as Clinton and our Founding Fathers envisioned it, is in favor of limiting government assistance/intrusion into the life of the nation. You say the election difference is the following: "President Barack Obama says that the federal government is a vital force for good; Gov. Mitt Romney says it should get out of the way of progress." That's not entirely accurate and too facile. Obama does not simply see the fed government as a vital force for good. He sees it as the source of good the source of everything. It's the default position. This in and of itself violates the social doctrine of the Church's basic principle of subsidiarity. A Leviathan-central government cannot be the default-position. The default-position should be local both the public and private sectors. Moreover the size of the federal government as it now exists is unsustainable. We are broke. Romney does not simply say the government should get out of the way but government should allow the private sector to produce without undue intereference. This creates jobs and actually creates more tax revenue to be used for the common good. Government jobs and programs. do not expand the economy. They have to be paid for by taxation.The highest tax revenues came in '07 after the tax cuts because a purring economic engine as a result of the private sector brings in more tax revenues not less. While Wall Street and banks are often portrayed as bogey-men by the media and statists what is conveniently left out is the part the government played via Fannie Mae and Freddy Mac in the subprime mortgage-meltdown while pols lined their pockets and the banks were forced to lend money to people who could not possibly pay back the loans. Government then decides who is too big to fail! In a sense this was the government (Democrats) not only promising a chicken in every pot but a house for anyone who wants one and later getting into the car business to save the auto union. This kind of pandering contributes mightily to the economic meltdown and is basically ignored by media who tend to be statists in their biases. It is not a good thing for people to be totally dependent on government or worse create that dependency and pander to it. Personal freedom and self-worth and independence are increased by a person seeking work, finding it, and being in charge of his/her own life. The current ideology is hostile to this. There should be a safety-net for those who literally cannot fend for themselves but this should be a small percentage and not the result of government seeking to create total dependents for the sake of votes and power. This article also appeared in print, under the headline "Current Comment," in the October 22, 2012 issue.